For a number of individuals, bankruptcy can be a daunting idea. Many people believe the negative myths about bankruptcy, and thus pass it off as a bad thing. At Wood & Brewer, LLC, we understand the various benefits that bankruptcy affords and our Columbus bankruptcy lawyers work directly with each client to help them achieve a fresh start. We bring more than 15 years of experience to the table and know the various methods that creditors use when seeking to collect on debts. It is our goal to guide you through these legal matters and we work to help you obtain the most favorable outcome possible. If you are wondering if bankruptcy is right for you, turn to our Westerville bankruptcy firm for guidance. If you are unsure if bankruptcy is right for you, feel free to reach out to our Columbus bankruptcy attorneys. We will never take on a case that we feel wouldn’t benefit you. 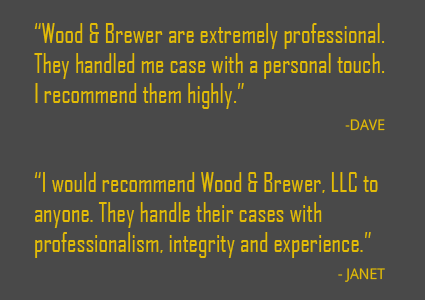 Trust that when you come to Wood & Brewer, LLC, you will work directly with your attorney so you can be sure that your questions are answered as swiftly as possible. You deserve a fresh start; let us help you achieve it. You shouldn’t have to deal with the hardships of debt, especially when your debt accumulated for reasons that could not be avoided. If you choose to hire our firm, we will get a thorough understanding of your situation and gather all necessary information. We will then discuss the various options that you have, determine the best course of action for you, and help you fill out the required paperwork so you can move forward through the process. Our team stands by your side throughout all matters and remain accessible 24/7 so you never feel alone. Backed by experience representing both debtors and creditors, we know the strongest ways to approach a case, whether you are saddled with credit card debt or student loan debt.